You’ll get two things here: how to measure SEO ROI for a fictitious new business and download our ROI calculator Excel spreadsheet to use for your own business. Most businesses realize that the Internet is a very effective medium to reach their target consumers. Nearly 90% of small businesses are investing money in their online marketing strategy. Search engine optimization (SEO) is one of the most valuable digital marketing means available. However, many businesses don’t spend enough on their SEO campaign to realize a decent return on their investment. As a business owner, you should understand the value of SEO and be willing to pay for services that will pay off over the long term. As with any investment, you should calculate the return on investment from SEO before allocating money to it. You will probably be surprised by how beneficial it can be to your bottom line. Many studies have shown that SEO is a profitable media channel for businesses. One study found that 72% of business owners with an SEO strategy felt it improved their bottom line. Conversely, only 5% that implemented an SEO campaign felt it wasn’t worthwhile. There are a number of reasons that investing in SEO can help your business. Arguably the biggest reason is that leads generated through search engines are much more targeted, which means that they are more likely to turn into paying customers. One study found that SEO leads have a 14.6% conversion rate, while the conversion rate for outbound marketing is only 1.7%. Search engine marketing is also a more scalable way to reach customers than outbound marketing. However, it only pays off if you invest in it up front. 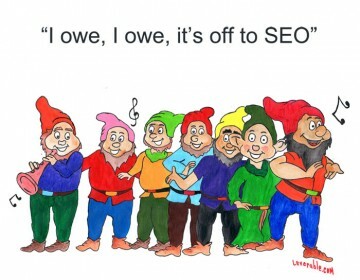 Data from the Small Business Success Index found that only 27% of SMB’s deploy an SEO strategy. Many of the companies that do focus on SEO don’t invest enough in their SEO to see any long-term benefit. They would probably be more likely to employ an aggressive SEO campaign if they calculated the ROI that it would provide down the road. Research has clearly shown that SEO is a great investment for many businesses. Many business owners are aware of these statistics, but still don’t believe it can benefit their bottom line. If you are still skeptical, then I encourage you to conduct an analysis to see how SEO will benefit your company. The quarterly cost of your SEO campaign. The estimated traffic that you will receive. An estimated conversion rate, which will allow you to estimate the number of new customers that you will gain. The revenue generated from each new customer, which will allow you to calculate the overall return of the campaign. There are a number of ways that you can estimate these variables. The SEO company you are considering working with will provide an estimate for the cost of a campaign. Bear in mind that some industries and regions are more competitive than others, so you shouldn’t necessarily be surprised if your SEO firm quotes a different figure than another business launched an SEO campaign. It is important to remember that the long-term benefits will probably be much higher as well. They can also provide you with estimated search volume for keywords that you are targeting. You can also verify these figures yourself by checking the Google AdWords tool. Estimating the conversion rate for the SEO traffic that you receive will be a bit trickier. The aforementioned study that pegs the average conversion rate at 14.6% should be taken with scrutiny. The figure will likely vary significantly between different industries. The best approach is to conduct a PPC campaign to see what percentage of your leads turn into paying customers. PPC conversion rates are a good baseline for the conversion rates that you can expect from organic search traffic. Data from Enquisite found that conversion rates from PPC traffic are about 1.5 times higher than that of organic search, so you should divide your conversion rates by that multiplier. You can also use your own company records or industry data to estimate the estimated revenue from each sale. You can also estimate this figure from your PPC campaign. In this example, we are going to cover a fictitious oil change center named Local Oil Experts that is benefiting from an SEO campaign. 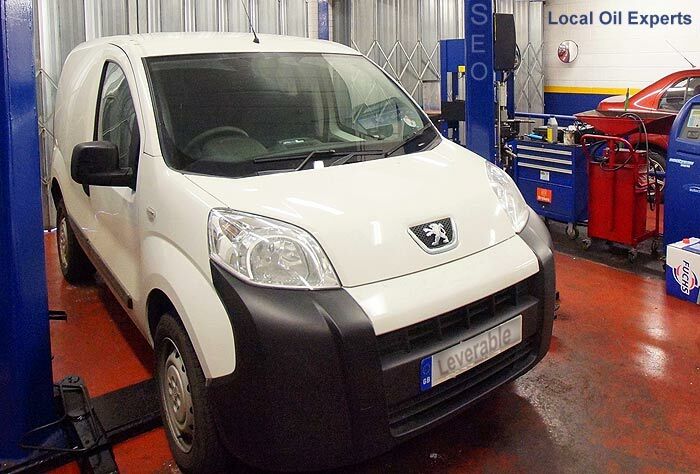 Local Oil Experts operates in a city a population of 150,000 and can reach about 3,000 visitors in its first year if it ranks for some of the top keywords auto consumers are searching for. Organic traffic will improve over time as the site is better optimized. The company will need to pay $4,000 a month to achieve these rankings. The above chart showing the ROI that the company can expect over the first two and one half years. The company conducted a PPC campaign and found that approximately 1.5% of its visitors actually bought its services. Since Enquisite found that conversion rates from PPC campaigns are about 150% higher than organic search, Local Oil Experts estimates that its SEO conversion rates will be about 1%. Local Oil Experts will need about a year to break even. However, it will make a 67% ROI in its second year, which offsets its first year’s losses four times over. The company’s ROI from SEO will exceed 4100% after 10 years. 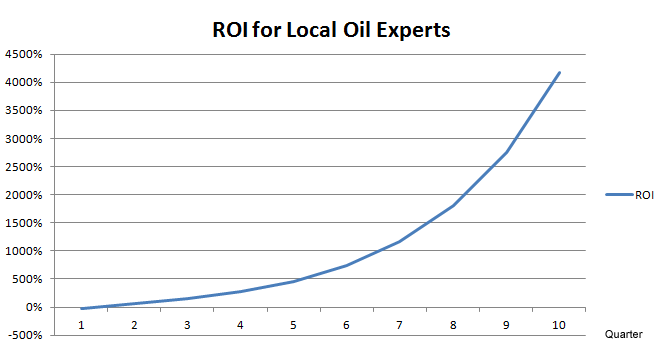 This clearly shows that Local Oil Experts will benefit from investing in a long-term SEO campaign. Search engines are clearly a great way to reach your customers. However, you are going to need to invest in an effective SEO campaign before you notice any results. Think of all the money that you spend on other forms of marketing. Have any of them yielded a 750% ROI after only a year and a half? 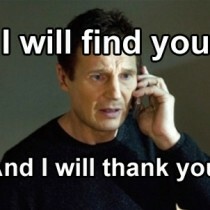 Paying for an SEO campaign is definitely worth the investment. Download the Excel spread sheet here and plug in your own numbers! Kalen Smith has been an online content marketer and SEO analytics researcher for the past five years. He has been published on the Content Marketing Institute, Hubspot, Business Insider and other entrepreneurial publications. He is also the author of "The Ultimate Guide to Guest Blogging" and several other informational products on digital marketing. Read more of Kalen's posts here. Google+. Absolutely. I agree 100% Kalen. What gets measured gets done. Thanks for sharing the excel template! I’m passing it along to some friends to help spread the word. I like this article and would like to add an interesting comparison. Being an SEO is kind of like investing. Anyone can do it, but not everyone can do it well. Just like doing good search engine optimization, investing requires a lot of disparate sets of skills and knowledge. Many businesses don’t blog because they don’t have a way of converting online visitors into revenue so they don’t even bother. The same applies to those people who don’t invest because they don’t see a short-term profit. Just like financial instruments, you need to research keywords/stocks and target them intelligently. Bad stocks/bad keywords equal bad results. Another similarity is that 80% SERPs change on a daily basis, much like the stock market. YES! The key is to measure and also to have patience and be focused on long-term investments (for stocks and for SEO). Take Warren Buffet’s advice and plan many years out. 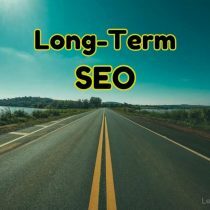 Dmitri, I think you are right about SEO being like long-term investing. I think both take patience, willpower and an almost stubborn mindset to do what’s right instead of what feels good. Warren Buffet would have made a great SEO. In my point of view, when you work in SEO you need a lot of patience and also an ability to build new strategy.